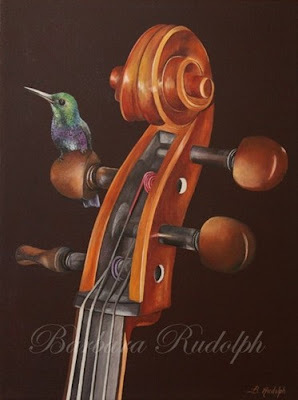 Barbara Rudolph Fine Art: Cello and Hummingbird Oil Painting "The Soloist"
Cello and Hummingbird Oil Painting "The Soloist"
12 x 9 x 2.50"
I just finished this oil painting ti﻿tled "The Soloist." It was a fun piece to do. I have been painting a lot of different pieces lately with a "musical theme." "The Soloist" is actually my daughters "cello." I always include a little bird in my compostions too. This little "hummingbird" looks so happy just sitting on one of the keys of the "cello." I have so many ideas lately that I have become addicted to painting again and I am really enjoying it. I will post some of the new work as I complete them, but will save some for my next art show. This painting is available for sale now. Your comments are always appreciated too, just click on the comment link below and let me know what you think. Thank you very much for your nice comments, I appreciate them. So elegant so beautiful. Perfect harmony of subject and medium. Backyard Swingers "My New Finch Swing"